The discussion began a few days ago when Jan Schwartz introduced readers to a webinar by Bullen, Separating Fact from Fiction in the Digital Generation (19 Jan. 2011), and in her article, she credits him for saving her from the “danger” of proliferating the myth about the “Net Generation.” With all this talk about “danger,” I decided I had to make time for the webinar. If I had to place myself in a generation, I’d have to say I’m in the TV generation. I was in grade school when TV antennas began sprouting on roofs in the neighborhood. That was the ’50s, and that tiny glowing window to the world was magic. For the first time, I had visual access to the world that film and printed material could only hint at. Overnight, the world shrank to the size of a base pad in our living room. Now that I think back, the word “danger” was also attached to TV. As a kid, September 9, 1956, Sunday evening, was one of the biggest days in my life. Elvis Presley appeared live on the Ed Sullivan Show. Back then, rock ‘n’ roll was considered dangerous, and Elvis was the king of rock ‘n’ roll. I never understood why it was dangerous, and I still don’t. Anyway, to learn more about the dangers of the “Net Generation,” I clicked on the link Jan provided and watched Bullen’s archived webinar. I dreaded the thought of sitting through a lecture in linear, chronological fashion, from start to finish. I seldom ever do that for any reading other than novels and shortstories. I scan more than read and can get the gist out of, say, an article, in a few minutes. If there’s anything worth pursuing, I double back to key places for more info. Thus, watching a 50-minute lecture that I could have read in minutes was torture. But I decided to gaman. Gaman is the Japanese word for endure, and it seems to capture the ordeal a lot more accurately. Thus, if Bullen and others like him can prove that the “Net Generation” is a sham, a fake, a myth, then all’s right with the world and college professors, administrators, and staff can continue as they have for the last century and a half without fear — adding an electronic bauble here and an internet gadget there in their aging classrooms and lecture halls. So, how do they go about proving that it’s all a lie? Well, as academics, they turn to their favorite weapon. Research. They claim that proponents of the term, “Net Generation,” haven’t done the research, that their arguments are built of sand and even a cursory step into their flimsy assumptions will bring them down. In other words, they don’t have hard numbers, and without them, their views are like sandcastles, easily obliterated. Thus, when I listened to Bullen’s lecture, I paid special attention to his research because, unlike his adversaries, he apparently had done his homework. However, when he finally arrived at the point where he would share the review of literature that supported his claim, he was suddenly aware of time and skipped through the slides so quickly that I wasn’t able to read them. Not a problem, I thought. Since the video was a recording, I could return to those slides later. When he arrived at this own research, I expected him to go into more depth since this had to be the primary proof for his claim. However, he went through the methods and procedures so quickly that I thought I had missed the most critical part of a study such as this — the subjects. After all, this was an investigation to determine if there were any significant difference between two supposedly distinct populations — Net Gens and Non-Net Gens. But I didn’t hear anything about the number of subjects, age ranges, class levels, or selection process. Did I miss it? I clicked on pause and tried to use the video scroll bar to move back to previous slides, but the feature was clunky and imprecise. I gave it up and decided to continue with the lecture. Surely subjects would come up again. Toward the end of the lecture, Bullen responded to questions from the audience — typed into a chat box and read by the host, Brian Mulligan. The very last was what I wanted to hear, but suddenly Bullen’s memory was less than precise about the subjects in the study. He faltered and seemed, to me, to be vague and evasive. Despite the awkward scrolling, I returned to earlier segments, especially those that presented supporting studies. I was surprised that Bullen provided few if any details to follow up on the studies. And I couldn’t find a list of works cited. After quick Google searches, I could find only a few of the documents. OK, I thought. This was a 50-minute webinar with slides so it’s reasonable to assume that some of the details would be omitted. These were critical in my eyes, but I can understand that they may not be as important for Bullen and others. In any case, he referred the audience to a written version of the study, “Digital Learners in Higher Education: Generation Is Not the Issue” by Bullen, Morgan, and Qayyum (Canadian Journal of Learning Technology, 30 Sep. 2010), which would provide the details. I’ll find the info there. When I logged in to the study, my first question was, Who were the subjects? I googled and quickly learned that they were students in 14 courses at British Columbia Institute of Technology (BCIT). Out of a 43,000 student body, 435 participated. And, surprisingly, level 1 and 2 courses were eliminated because, Bullen et al. explain, “these were courses taken mainly by first-year students. These first-year students were removed from the sample because the survey was being administered early in a new academic year. Most first-year students would have little experience at the institution to draw on to complete the survey” (7). This decision seemed odd to me since, by the researchers’ logic, the first-years would be the least “contaminated” group. For a study such as this, prior learning could be a confounding factor that jeopardizes validity. That is, the results may be attributable to variables other than generational differences. As it were, those in the actual sample were upper-level students who were already immersed and experienced in “the program structures and cohort models at the institution [which] require 25 to 35 weekly classroom hours” (13). 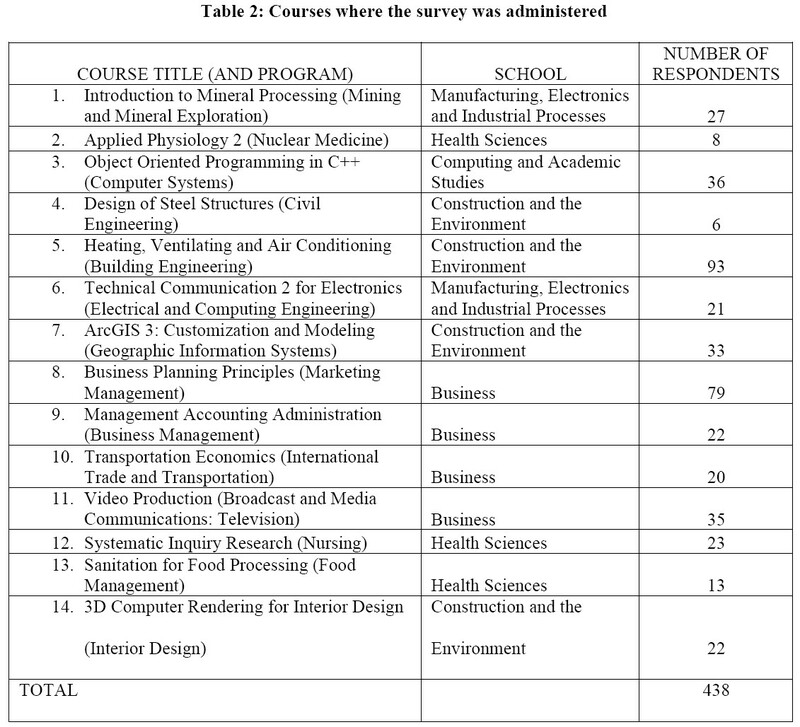 Since BCIT is a technical institute, the students were from technology-oriented courses — see the table below. Thus, they can’t be considered representative of all college students. In fact, the only meaningful generalizations would be narrowed to non-level 1 students in similarly intense technical colleges. The authors mention this limitation in the written report of the study, but Bullen fails to make it clear in the webinar, leaving the impression that the results are generalizable to all colleges. The year 1982 was used as the cutoff. The Net Gens, born in 1982 or later, would have been 28 or younger at the time of the study. The Non-Net Gens were 29 or older. There were 323 Net Gens and 91 Non-Net Gens, for a 78%-22% split. This huge disparity in numbers surprised me. A more even split, I would think, would be a goal since number of respondents could impact outcomes. For example, Non-Net Gens who were less technically inclined might have systematically refused to participate in the study. Furthermore, in his response to the age question at the end of the webinar, Bullen said the ages ranged from 18 to mid-50s. According to the paper report, the average age was 24.1 years, which probably means few were in their 40s and 50s. A more even distribution of ages might have affected the results. In his attack on Net Gen advocates, Bullen was especially critical of generalizations built on poor sampling practices. Yet his own sampling raises questions. For example, the subjects, despite age differences, appear to be from the same population by virtue of their fields of study (technical), study habits, and immersion in “the program structures and cohort models at the institution.” Thus, any absence of significant differences could be attributed to a lack of true randomness in the sampling pool. Furthermore, the study reports that the students, regardless of generation, were content with the quality and types of technology used in their courses. Yet, in “Are Digital Natives a Myth or Reality? : Students’ Use of Technologies for Learning” (11 Dec. 2008), which Bullen cites in support of his position, Margaryan and Littlejohn warn that their “study shows that students’ attitudes to learning appear to be influenced by the approaches adopted by their lecturers. Far from demanding lecturers change their practice, students appear to conform to fairly traditional pedagogies, albeit with minor uses of technology tools that deliver content” (1). In other words, Net Gens might have been taking their cue from the way classes are run at BCIT. Had they had opportunites to learn under different conditions, e.g., social networking in completely online learning environments, they might have responded differently. In another study, “The ‘Digital Natives’ Debate: A Critical Review of the Evidence” (British Journal of Educational Technology, 2008), cited in Bullen’s webinar in support of his position, Bennett, Maton, and Kervin say that their “evidence points to differences in the ways young people use technology inside and outside of school, and suggests that school use of the Internet can be frustrating, but there is little basis to conclude that these differences are causing widespread and profound disengagement in learning” (781). In other words, the fact that students aren’t complaining about the technology in their BCIT classes doesn’t mean there are no differences between the generations. In fact, the implication is that the use of technology within schools may not be an appropriate variable in measuring the differences between generations. The real differences may be outside the context of rigidly controlled college classrooms. Bullen also cites “The Literature on Young People and Their Information Behaviour: Work Package II” (18 Oct. 2007) in his Webinar. The authors, Williams and Rowlands, say that “all (10) of the studies which looked at young adults, were university-based. As Large (2005) has pointed out, ‘In comparisons between young people and adults, …[research] … has focused very heavily on university students, who may not be the most interesting group to compare with children and teens'” (6). The implication here is that Net Gens, as a whole, may have significant in-group differences. Bullen also makes this point, but having made it, he fails to follow up on the possibility that a different subpopulation of Net Gens, perhaps in their early teens, might differ significantly from Non-Net Gens. Williams and Rowlands also warn about problems with sampling: “As can be seen, virtually half (24/49) of research studies reviewed had sample sizes of 50 or below. Indeed, of the 15 studies with 100 plus subjects, five represent what is almost certainly the same sample of 188 children aged 4 to 18 years, from various schools in the Whitley Bay area of the UK, reported on by Shenton and Dixon (2002, 2003a, 2003b, 2003c, 2004).” Yet, in the webinar, Bullen fails to mention the authors’ concern about generalizability based on small sample sizes or poor sampling procedures. So who is Mark Bullen and why does he view Net Gens as a threat? In the first three paragraphs on his “about me” page in his personal blog, we learn that he is the dean of the Learning and Teaching Centre at the British Columbia Institute of Technology (BCIT). Prior to that, he was the Associate and Acting Director of the Distance Education and Technology department at the University of British Columbia (UBC) and the Director of the Centre for Managing and Planning E-Learning (MAPLE). In short, he has invested a lot of his time and the colleges’ resources in developing and maintaining current practices, and one has to wonder if this track record might explain his efforts to defend the status quo against the real or imagined dangers that the Net Gens represent. I question the oversimplification of the issue of technological change. Regardless of whether or not Net Gens are different, colleges ought to be looking at ways to use technology to improve learning. In other words, change and improvement, as goals, are independent of generational differences or similarities. To use the lack of difference as justification for continuing business as usual is missing the point of technology altogether. Technology is here to stay, and its presence will only grow exponentially in the coming months and years. This fact alone ought to motivate educators to explore ways to adapt or adopt it in innovative ways. The quibble about Net Gens is, at best, a distraction. Throughout the webinar and the coauthored article, Bullen inexplicably places a premium on some forms of research and rejects others as worthless. Yet, a closer look at what he refers to as “research” reveals what amounts to reviews of literature masquerading as research and studies with limited generalizability and often conflicting or confounding findings. In each case, the “research” has limited usefulness for teachers in the field. There are also problems with the validity of survey designs that need to be addressed. Bullen’s dismissal of research methods that are also used by classroom teachers is unfortunate. Personal and shared observations, experiences, anecdotal evidence, informal studies, etc. can be extremely effective as research tools and have been used for ages by teachers. They are often more relevant than huge, expensive, formal studies that were conducted under remote conditions that simply can’t be replicated in a teacher’s classroom. Teachers can design and carry out informal research of their own to test different approaches, hunches, resources, etc. in the confines of their classroom. What they learn can enhance their practice, and when shared with others by word of mouth or publication, the ensuing dialogue can be invaluable. In fact, in my experience, this is the type of research that’s the most effective and, in the long run, sustainable. Change begins, in other words, with a teacher identifying a problem in her classroom, analyzing it, adapting, adopting, or inventing solutions, testing them, sharing the results with colleagues, etc. She doesn’t call it “research,” but that’s exactly what it is. In fact, this is what teaching is all about, day in and day out, and this is what makes it the world’s most challenging profession. Despite the fact that the “Net Generation” might be a myth, students younger than 30 who are comfortable and proficient in ICT for personal and extracurricular purposes provide an opportunity for further study. Colleges should view them as an asset rather than a threat. If the Net Gens are significantly different from older generations, then colleges have all the more reason to open their arms to change. How, exactly, do they use ICT outside of classroom situations? How can these practices be incorporated into formal learning? Do they provide the foundation for radically new visions of what a college can be? If yes, what are those visions? If no, what needs to be changed before they can become useful tools for learning? Finally, for what it’s worth, I believe the “Net Generation” is not a myth. It’s probably true that there are many exceptions, but as a whole, I believe people born in the last 30 (or even 40) years are different from those who grew up in the ’50s and ’60s. I don’t have hard numbers so this is an opinion, but it’s an opinion based on 35 years in the college classroom and on being a father of four children. The difference isn’t so much in their ability to do or not do the things that I consider ICT savvy. It’s in their expectations and view of the world. For them, anytime-anywhere communication is a fact of life. For them, photo albums, favorite music and videos, address books, friends, file cabinets and files, personal journals, phone books, shops, news, movies, restaurants, travel agencies, dictionaries, encyclopedias, language translators, novels, books, periodicals, exotic places in the world, romance, games, museums, classes, course grades, teachers, counselors, advisors, tutors, librarians, doctors, lawyers, politicians, government services, college catalogs, college schedules of classes, tax forms, applications and reservations for driver’s exams, live sports events, TV programs, music shops, radio, maps, telephones, social networks, calendars, schedules — all are online and accessible via tiny shirt-pocket-sized personal communications devices such as the iPhone. And these are two-way. They can interact with anyone from anywhere either synchronously or asynchronously, and they can do so with photos and videos, which they’ve shot themselves with their iPhones, as well as text. Does this make them different? Well, think about it. Bullen’s warnings notwithstanding, we don’t need research for this. Their sense of space is radically different. By removing the face-to-face (F2F) dimension from communications, they no longer need all the accoutrements that go along with F2F interactions. Their sense of time is radically different. They can find information about almost anything from anywhere in the world, 24-7. They can do so instantly. What are the implications for colleges? The most obvious is that classrooms and offices are no longer necessary. Their functions can be transferred to ICT devices. This doesn’t mean that colleges should abandon their buildings and campuses, but it does mean that they ought to begin looking at ways to use the new media to facilitate learning by a new generation of students for whom anytime-anywhere is a reality and not just an option. Today’s students expect response. If they punch something into their electronic devices, they know they’ll get something back. It’s this interactivity that really defines the new generation, IMO. So, education must stop being a one-way street. It must mimic the life experience of our students. You can deny it, but you cannot avoid it. When you see a big wave coming, you can duck under it, you can let it push you to the bottom, or you can catch it and enjoy the ride. The choice is yours. Harry, your wave analogy is a good one. There’s only one sweet spot on a wave, and to be there, you have to continually monitor the sets coming in and beat others to it. You then have to paddle like crazy to catch the wave. Simply sitting on your board and waiting for the sweet spot to come to you would be pointless. And catching the wave once it’s broken and turned into churning whitewater is only for beginners or surfers who’re returning to shore. No research data here. Just your eyes and experience and a means to triangulate the position of the sweet spot. On the South Shore, we used the hotels or buildings (including their vertical lines of windows) in front of us and landmarks on the Diamond Head side of Waikiki to make sure that we were in the correct spot for the next set. The sweet spot changed from time to time so we continually recalculated our positions. As educators, we have to learn to trust our ability to figure out where our students are and how to get them to the next level. And we have to be able to do this on the fly by identifying landmarks or signs and by applying strategies that we’re continually developing or creating. I have no problem with you critiquing my research but please get your facts straight and don’t attribute false motives to my work. As you note, I have spent my entire career working in the field of educational technology, e-learning and distance education. I have been experimenting with new technologies and innovative teaching and learning approaches for over 30 years. Anybody who knows me knows I am not an advocate of the status quo in teaching and learning. I try to remember to make this point before I give presentations on our research because it is often misinterpreted as as an argument for the status quo. It isn’t and that isn’t why we are doing this research. As an aside, I find it curious that you would conclude that because somebody has invested his career in this field he must be opposed to change. As to some of your key criticisms, we have never claimed that the results of the research we are conducting at BCIT are generalizable to any context other than BCIT. Our sample was randomly selected from the BCIT student population and we are confident that the methods we used, which are detailed in the article you mention, produced a sample that it is representative of that population. Many of the other studies that we cite have not produced results that are generalizable beyond their contexts either. However, if you look at all the research that has been done on this issue, as we have done, it pretty clear there is no credible evidence to support the idea that there is a generation with a homogenous set of characteristics that can be attributed to its use of digital technology. Yes, we cite literature reviews but we also cite original research studies. By my count there about 16 in the reference list on our website (http://digitallearners.ca). And we do not dismiss the kind of informal research that goes on in classrooms. We know there is a place for anecdotal observations and we are not suggesting all change needs to await rigorous research. However when institutions are contemplating making significant and costly changes we believe they should be doing this based on evidence not hype. We are also not suggesting that our findings mean there is no place for technology in education or that change is not needed. Quite the contrary, we are all passionate advocates for innovation in teaching and learning and the appropriate use of new and emerging technologies but decisions need to be based on the needs and characteristics of OUR students not some mythical net generation student. That is the focus of the second part of our research: to uncover what is really happening, how students are using the new technologies in their social and academic lives and what that means for educators. Unlike the net generation proponents, all of our work is publically available on our research website (http://digitallearners.ca). This includes not only our articles and reports but our survey instruments and our research methodology. The key point is this is a social issue not a generational issue. Mark, thank you for your response. Re getting my “facts straight” — the facts are straight forward: your webinar lecture and your coauthored research study. There are links to both in the article. The task for the reader is simple but requires effort. S/he will need to view the entire lecture and read the study. She’ll have to do it methodically. For example, I took two pages of handwritten notes for the lecture. I spent time searching for the sources you mentioned in the lecture. I found some of them, downloaded them, and read them. I downloaded and read the coauthored study. I’d also suggest that you take the time to sit through the entire webinar lecture, as I did, and view it from the perspective of someone who’s unfamiliar with your, Mark’s, works. I believe you might be surprised at what you actually hear instead of what you think you’ve said. I’d also ask readers to suspend judgment until they’ve carefully read my article and weighed it against your comment. I applaud you for taking the time to do such a thorough analysis of my work. I only wish people would do the same with the work of Tapscott and others who have helped perpetuate the myth of the generation. As one of the co-authors of this article, I’ll quickly respond to one of your points, also taken up by Downes in his Daily http://www.downes.ca/post/55010. Apologies, since I know that your post deserves a much longer and more detailed response, but I’m sure Mark will have something to offer in that regard. Actually, our point is the opposite: Bullen has repeatedly said that our research is not suggesting that change of practice isn’t needed–in fact, we know there is a lot of room for improvement and a very real need for change. But an elearning strategy probably shouldn’t be based on broad net gen assumptions, since, as we learned (and were surprised to learn at our institution) they weren’t an accurate reflection of our students. One of the reasons we conducted this research at our institution was because we weren’t a ‘typical’ large research university, but a post-secondary polytechnic with a very diverse demographic and offering both trades and technology programs not typically found at a public university. Net Gen folklore makes it easy to spend money on technologies in the rush to be relevant, without acknowledging that students’ abilities, needs, prior experiences, and actual use may be vastly different. If your institution has lots of $$ that may be fine, but at my own institution it requires better evidence, which is really the point. Ms. Morgan, thank you for your comment. Re “Bullen has repeatedly said that our research is not suggesting that change of practice isn’t needed” — please view the webinar from the 33:40-35:00 time marker. I’d quote it here, but I don’t have the time to transcribe it. “[Net Gen] claims have potentially significant and costly implications for educational institutions . . . as they are being urged to make significant changes to how they are organized, how they teach and how learning technologies should be used” (1). Yes, you do say that Net Gen claims shouldn’t be used as the reason for change, but you also don’t build a viable case for other claims — or for any claims, for that matter — that do justify change. Thus, the only conclusion that’s left is that change isn’t justified until, as you say, “better evidence” is found. And from the lecture and the study, the implication is that “better evidence” hasn’t been found. Furthermore, in the following statement, you clearly limit the generalizability of the study to your BCIT population: “But an elearning strategy probably shouldn’t be based on broad net gen assumptions, since, as we learned (and were surprised to learn at our institution) they weren’t an accurate reflection of our students.” [Bold added.] Again, many of your other statements (e.g., see the ones I’ve quoted above) contradict this qualification. Finally, your use of the phrase “Net Gen folklore” is unfortunate since it belittles the findings and observations of many of our colleagues. One of the purposes of our research has been to determine whether or not the key net generation claims are accurate and based on evidence so I”m not sure why we have a responsibility to “build a viable case for other claims”. Surely that is the responsibility of whoever is making those claims. And to say that since we don’t do that we are concluding that change isn’t justified is illogical and a misreading of our work. We have said repeatedly in our presentations and articles that we need to understand the impact of digital technology on higher education but institutional change has to be based on the specific needs of each institution, its students, faculty and programs not unsubstantiated myths about a generation. I also listened to Professor Bullen’s webinar, Jim, though I didn’t take notes (more about that further down). My understanding of his message was not: “Do as we do at BCIT on the basis of our survey”, but “Do a survey like the one we did at BCIT in your own institution, and base your institution’s policy about tech use on the replies you’ll get to your survey – rather than on other people’s generalizations about generations”. And maybe such surveys should even be more specific: divinity students at Harvard may not have the same requests for tech use in courses as those who chose to read internet law there because of the research and projects going on at the Berkman Center for Internet and Society. Now some meta-tech stuff on why I didn’t take notes on the webinar: recorded virtual room events are streamed, and hence a thorough pain if you are on a mobile or wifi connection connection: I kept getting disconnected, and having to wait while the **** contraption was rebuffering. By contrast, Steve Hargadon has been offering the past The Future of Education webinars both as streamed “virtual room recordings” (like Prof. Bullen’s), AND as .mp3 files that are much lighter on bumpy connections. Moreover, once you have an .mp3 file, you can then take notes about it in the “labels” track of your audio editor (1), or make a mock video of it and hijack an online video captioning tool to take notes on it -even collaboratively – if you don’t have time to transcribe the whole thing. (1) I do that with Audacity, a free, multiplatform software: see the Audacity label track tutorial. But someone who works for a radio told me all serious audio editing softwares have the same label track feature. Thanks Claude. That’s exactly what I was saying. Re: your point about mp3 files, I agree that would be a more convenient way to listen to the webinar. Unfortunately, I don’t have any control over how the webinar was recorded or distributed. Glad I got your message, Mark. Re the mp3 remark, I should have added that they were not directed at you, but a little bit at Sligo university who hosted your webinar, and at other institutions hosting webinars and streamed online events in general. An normal online video, if captionable or even better, already captioned, can work too: see the White House one of the recent Anti-Bullying Conference I embedded in a comment to Nancy Willard’s interview on cyberbullying. BTW, that conference – and the stopbullying.gov site that was launched at it, also advocate a teaching-institution-centered approach. I’m 59 now, and still “cybercurious” – not about cyber things per se, but about what they can help me do. Although I hosted this webinar, I would consider myself neutral. I am an e-learning practitioner who scans research in order to quickly find useful strategies and tactics for my work. I find it tedious to check out much of this research in detail and that is why I am prone (like Jan Schwartz it seems) to fall for seemingly logical propositions like the Net-gen theory. However, when such a theory does not match my own personal experience I do become very interested in the skeptical point of view. I invited Mark Bullen to speak on this topic, because, as an advocate of the use of learning technologies (unlike the guy who wrote the digital diploma mills book whose name I can’t remember), he would generally be expected to support such a theory, and because of that his skepticism is likely to be well founded. So I had lots of reasons to be convinced even before looking at the data. Now Jim’s critique started badly for me. He started with a criticism of the media and how he decided he would have to ‘endure’ it. He then immediately states that Mark is worried about the idea that such a theory might require colleges to change institutional practices. As a neutral, this does not ring true, as Mark is heavily involved in learning technology development which in itself is a sign of commitment to change in higher education. The points made about the inadequacies of the research presented might well be valid, but as a busy person I don’t really have the time to do this and as such I will use other indicators to make a guess at which side is likely to be true. Jim’s approach to arguing did nothing to sway me away from my current stance. In fact, it surprised me that he might use a webinar recording at all to find out the information he needed as the arguments with associated links to the research are all laid out in Mark’s blog (http://www.netgenskeptic.com/). Now this is what Jim does, later (as part of a very long blog entry), but at this point I’m wondering if it is worth while considering these objections based on what seems to be the lack of objectivity displayed so far. So I’ll tell you what I’ll do. I’ll wait for further research and debate to make a final call on this and meanwhile I’ll take a bet that the NetGen theory is probably not true and I’ll spend the money we were going to spend based on those theories on something else. How about this folks? Connect Pro is a wonderful system for hosting live events but, as has been remarked by several, is not so good for generating recordings. We’ll spend the money on a better recording and publishing system. Brian, thank you very much for taking the time to comment on this article and discussion. I wasn’t planning to add anything further to this discussion since I feel I’ve already said what I needed to say. And one of those points is that the facts are before us: your webinar featuring Mark, the co-authored article about the BCIT research, my article, and the comments in this discussion. However, facts aren’t very useful if readers don’t actually take the time to carefully review them. That is, if they wish to be fair and objective in their comments. You claim that my article lacks objectivity, and I thank you for citing specifics that we can address rather than relying on broad attacks that can’t be nailed down. I can only conclude that you haven’t actually read the co-authored article very carefully. Re your “surprise” that I’m relying solely on the webinar links — you obvioulsy haven’t read my article either re those links. Comment 2: re your objectivity, you say “I would consider myself neutral” and, later, “As a neutral.” You also obviously haven’t listened to your own webinar recording, specifically your introductory comments from the 00:25 to 01:25 time markers. Your other comments as well raise questions about your neutrality, including “when such a theory does not match my own personal experience,” which appears in your posted comment. Comment 3: “I invited Mark Bullen to speak on this topic, because, as an advocate of the use of learning technologies . . . , he would generally be expected to support such a theory, and because of that his skepticism is likely to be well founded. So I had lots of reasons to be convinced even before looking at the data. . . . Mark is heavily involved in learning technology development which in itself is a sign of commitment to change in higher education.” This is a non sequitur, which simply repeats Mark’s claim in one of his posted comments. There’s a lot of wiggle room in the category “learning technologist,” and you can’t assume that it means an objective predisposition to technology in general. What, specifically, does Mark advocate re “the use of learning technologies”? From the information in both the recording and the article, I see nothing that indicates advocacy for and instructional development and implementation of some of the latest open social networking and personal communication technologies that define the younger generation. In fact, from the glimpses I’ve had from the recording and the article, his views seem almost reactionary. Comment 4: “[Jim] then immediately states that Mark is worried about the idea that such a theory might require colleges to change institutional practices. As a neutral, this does not ring true, as Mark is heavily involved in learning technology development which in itself is a sign of commitment to change in higher education.” As I mentioned above, this is a non sequitur. But to simply attack without a reason would leave everyone wondering, “So what?” Thus, he includes an alarming reason: Colleges are in danger of using the Net Gen argument to guide technological change, and the danger is that the Net Gen claims are false and will lead to waste of scarce resources with nothing to show for it. The problem is that the criteria Mark fixes on to define Net Gen inspired changes are so broad and inclusive that they include much of what’s considered best practice. Oddly, Mark actually accepts most of these as valid ends and says they’re not new and that we’re already practicing most of them. Yet, in the very next breath, he launches into exposing the poor research behind Net Gen claims and generalizing that they don’t justify the very changes, listed above, that he appears to support. Then what is Mark saying? That the Net Gen research is poor, but the implcations are fine? If yes, then what’s the point of the presentation? What exactly is Mark’s point? That’s the heart of the problem. No one knows for sure. And apparently he doesn’t either since, in rejecting my view point, he endorses Claude’s: “Do a survey like the one we did at BCIT in your own institution, and base your institution’s policy about tech use on the replies you’ll get to your survey – rather than on other people’s generalizations about generations.” Mark’s reply: “Thanks Claude. That’s exactly what I was saying.” Of course, he may be implying (there’s no direct statement like this anywhere) this as well as a whole slew of other things, and depending on whim, he could choose to say “That’s exactly what I was saying” or “That’s not what I’m saying” to a whole bunch of other views — and still be “correct.” Furthermore, if this is the point, then my synopsis of the point — “If the ‘Net Generation’ is truly different, then colleges would have to change instructional practices to accommodate the new learning style” — in my article is valid. That is, in the BCIT study, results showed no significant differences, and Mark’s conclusion for BCIT is no change is necessary. In fact, this is what he says in the video from the 33:40 to 35:00 time marker. Comment 5: “Now Jim’s critique started badly for me. He started with a criticism of the media and how he decided he would have to ‘endure’ it.” Objectively speaking, what does my criticism of video lectures have to do with my objectivity? Yes, I’d prefer a written transcript to a video lecture, but since that wasn’t available, I had to endure the video. I qualified what I meant by “endure” — that it doesn’t allow me to scan the material quickly and skip from part to part easily. The video’s linear format, in my opinion, is non-intuitive in terms of the web’s capabilities. In fact, the video format made it difficult to analyze Mark’s presentation, which focuses on and relies heavily on research and references. One of the tenets of academic discussions is to facilitate review, and the whole documentation process is aimed at this one goal. In light of the purpose and content of this particular webinar, I believe my criticism of the video format is justified. Comment 6: “I’ll wait for further research and debate to make a final call on this and meanwhile I’ll take a bet that the NetGen theory is probably not true and I’ll spend the money we were going to spend based on those theories on something else.” Brian, I commend you for “waiting for further research and debate,” but the waiting would be pointless if you’ve already made up your mind. Comment 7: “I find it tedious to check out much of this research in detail” and “The points made about the inadequacies of the research presented might well be valid, but as a busy person I don’t really have the time to do this and as such I will use other indicators to make a guess at which side is likely to be true.” As I suspected from reading your comment, you’ve relied primarily on comments made by people with your frame of mind rather than the primary sources (facts) under contention. I’m taking the time to respond at length to your comment because I think this point is important: As educators participating in a serious debate on an issue that might have consequences in terms of ICT program planning, we owe it to ourselves, our colleagues, our institutions, and especially our students to independently and objectively review the facts before we speak out. There are two points I’d make about this. There is nothing wrong with reviewing the literature, indeed it is a necessary basis for any serious work and it might have assisted your posting if you had followed up some of the range of references you can find on Mark Bullen’s research site. Secondly good research does throw up conflicting and confounding findings, we do research to reveal complexity and then go on to try and account for it. The Net Gen and Digital Native literature provides an oversimplified characterisation of an entire generation without providing any real research support. Well anyone can believe whatever they want based on their own experience! I have 2 daughters and experience in Higher Education and I was born in 1951 but I’m afraid this doesn’t provide a solid basis for advising on policy in universities. I conduct research to try and put some solid ground beneath the opinions I express. This is essential if we are not going to follow one wave of hype after another. By all means criticise the research we have all done for its weaknesses. My own research has clear limits and I am very willing to talk about them. Research evidence is however the best we have got, much better than anecdote and personal experience. Perhaps your readers will go on to read some of the recent research (see below) and not simply swallow your shallow critique. Jones, C. (Ed) (2010). Learning, the Net Generation and Digital Natives. Learning, Media and Technology. 35 (4), pp 365 434. Jones, C. and Czerniewicz, L. (Eds) (2010). Net Generation. Journal of Computer Assisted Learning. Vol 26 No5., pp 317 – 369. Judd, T., & Kennedy, G. (2010). A five-year study of on-campus Internet use by undergraduate biomedical students. Computers & Education, 55(1), 564-571. Smith, S.D., and Borreson Caruso, J. (2010). The ECAR Study of Undergraduate Students and Information Technology, 2010 (Research Study, Vol. 6). Boulder, CO: EDUCAUSE Center for Applied Research, 2010. Retrieved from http://www.educause.edu/ecar . Hey, Chris. Thanks for taking the time to participate in this discussion. I know how busy we all are so I appreciate your effort. Since I’ve already covered or responded to most of your points in my article and earlier comments, I’ll keep my responses brief. Chris: I was surprised to say the least at your attack on Mark Bullen and the work he and others have done. First, my article is primarily a response to the webinar. I turned to the article to find answers to some of the questions that I felt weren’t adequately answered in the presentation. Second, I can’t imagine why you’re “surprised.” The webinar is a relentless attack against Tapscott and Prensky and all who believe that the Net Genners are distinct. What else could you expect in response? Third, the only statement that could be interpreted as an “attack” on Mark is this: “One has to wonder if this [referring to the bio in his blog] track record might explain his efforts to defend the status quo against the real or imagined dangers that the Net Gens represent.” I’ve clearly qualified this statement as conjecture. In the rest of the article, I take aim at specific statements. Chris: There is nothing wrong with reviewing the literature, indeed it is a necessary basis for any serious work. I’m referring to some of the studies mentioned in the webinar that I did read. Mark lists these as “good research,” but some of these are simply reviews of selected studies. They’re not based on primary research. Chris: It might have assisted your posting if you had followed up some of the range of references you can find on Mark Bullen’s research site. My article is based on some of the studies cited in the webinar — ones that I could find. I make no claims about the studies that I didn’t read. Chris: Good research does throw up conflicting and confounding findings. Yes, and when quoting results, these are also reported. Chris: The Net Gen and Digital Native literature provides an oversimplified characterisation of an entire generation without providing any real research support. “Oversimplified”? If “research” is your foundation, then seems to me you’d have to take all of the hypotheses in the Net Gen argument — one at a time — and subject them to tests before considering the null hypothesis (no significant difference) true. To say the least, the list is enormously long. Chris: Well anyone can believe whatever they want based on their own experience! I have 2 daughters and experience in Higher Education and I was born in 1951 but I’m afraid this doesn’t provide a solid basis for advising on policy in universities. Chris: By all means criticise the research we have all done for its weaknesses. My own research has clear limits and I am very willing to talk about them. Research evidence is however the best we have got, much better than anecdote and personal experience. Perhaps your readers will go on to read some of the recent research (see below) and not simply swallow your shallow critique. Re your first point, yes, I have criticized some. Re your second (your research) — point me to one that touches on this subject and I’ll take a look. Re your third (research vs. anecdotes) — I’d say it all depends. Re your fourth (our readers) — I can’t speak for them. Re your last — most of our readers rarely “swallow” anything that resembles BS. And I count on this. thanks for the quick reply. Have you attempted to review the evidence in favour of the claims that are made for their being a Net Generation of Digital Natives? All your criticisms of Mark and other researchers trying to build a solid research base would apply to them – in fac t much more so. Did you ever see Marc Prensky weigh up the opposing arguments? How about Don Tapscott? My argument is for solid research and I provided links to larger research projects and a set of recent peer reviewed publications. I repeat there is a lack of solid research supporting the Net Gen or Digital Native arguments. Can you point to some? You’ll see references to my research in the last posting and you can find our project web site in the list in the same post. Chris, again, thanks for your comments and the opportunity to extend this discussion on the implications of generational differences for pedagogy. I’ve already responded to comments similar to these in my article and discussion posts so I won’t repeat them. What I will say, though — and this is the message in my article — is that we don’t need to belabor the obvious. We don’t need research to tell us that we’re no longer in Kansas. In fact, if you look at the implications for education based on Net Gen arguments, you’ll see that they’re either already in place or being developed as best or effective practice: interactive learning, collaborative learning, multimedia strategies, learning that’s entertaining or fun, personalized learning, active learning, digital game-based learning, personal learning/networking environments, etc. And as I said in an earlier comment, to quibble about whether or not Net Genners are or aren’t different may be interesting to some but besides the point.